Every team needs a rock solid defender, a tough-tackling midfielder to have any chance of being successful in the Premier League; and Leicester City are no different. The Foxes have had copious amounts of players that fall into each of these categories, but here are 10 of the hardest players to play for Leicester City. ​Leicester’s Premier League winning captain Wes Morgan was, and is still is, a tank of a centre-back. The 6’1 defender has been known for his tough-tackling at both his clubs Leicester and Nottingham Forest. The Jamaican has received seven red cards throughout his 17 year playing career. Morgan has managed to pick up two of those suspensions this season, earning a second yellow card in defeats to Bournemouth and Everton early in the campaign. Perhaps one of the hardest men in British football. Neil Lennon played up to the hard-man role at every club he played for and has one few occasions brought that side out as a manager. ​Surprisingly only sent off three times in his career. Lennon was known at Leicester as the their tough midfielder who wasn’t afraid of flying into any tackle, or opponent. Lennon’s managerial career has seen the Northern Irishman involve himself in bust ups with other managers and even his own team. Lennon and Ally McCoist famously locked heads during a heated Old Firm game in 2011. Robbie Savage is undoubtedly one of the most hated players in Premier League history. ​The Welshman was notorious for his tough tackling approach. He accumulated a staggering 123 yellow cards in 502 games but only managed one red card. He picked up 14 yellow cards during his last season for Leicester. Paul Dickov was an absolute nuisance for defenders despite his height and often labelled as one of the most difficult strikers to play against because of his aggressive nature. The Scot played the majority of his career with Leicester in two different stints with the club. He made 118 appearances for the Foxes and scored 36 goals. Danny Tiatto only spent three season with Leicester, but managed to pick up 27 yellow cards as well as one red. Despite his ill-discipline, Tiatto was voted Foxes’ player of the year in 2005 and also enjoy a spell as club captain. Heskey’s career may have taken a dismal turn towards the end but when he burst onto the scene at Leicester, defenders were scared to play against him. Nicknamed ‘Chopper’ Chalmers based on his approach to a fully committed playing style. Chalmers played for Leicester between 1957-1966 making over 170 appearances for the Foxes. 'Chopper’ famously played one hour of the 1961 FA Cup final defeat to Tottenham Hotspur with a broken leg. Elliott was well known as a bruising defender during his time at Leicester City. The defender suited the style of play that Leicester had adopted during the late 90s. Despite his ill-disciplined nature, he only managed to earn 28 yellow cards and two red cards in over 250 appearances for Leicester. Dennis Wise may have only played 17 times for Leicester but should always get a mention when the term ‘hard man’ is used. 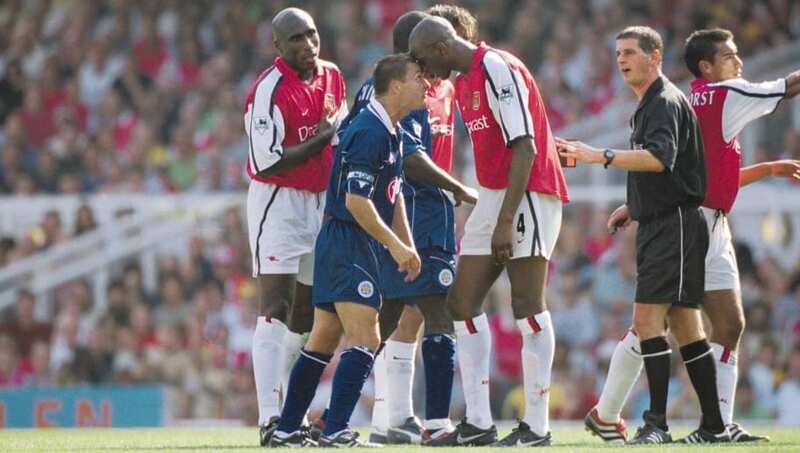 Wise’s time at Leicester could be summed up by the famous picture of him squaring up to ​Arsenal and Patrick Vieira, who was good eight inches taller than Wise. ​Jamie Vardy may be more hot-headed than a hard man, but the former England striker has had his fair share of showdowns during his time with the Foxes. Vardy has proven on multiple occasions that he is not a player to mess with on the field. Vardy is fairly ill-disciplined for a striker earning himself four red cards throughout his career, three of which came as a Leicester City player. The non-league to Premier League title winning hero has even previously stated that he fancies former footballing hard man Vinnie Jones to play him in a movie about the Foxes striker’s career.